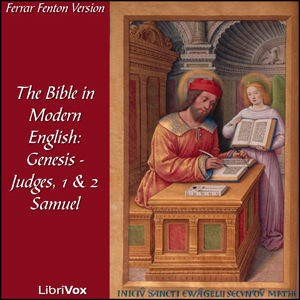 Listen to "Bible (Fenton) 01-07, 09-10: Holy Bible in Modern English, The: Genesis - Judges, 1 & 2 Samuel" on your iOS and Android device. Work on the translation began in 1853 by a London businessman called Ferrar Fenton (1832-1920). The complete Bible was first published in 1903, though parts were published as separate volumes during the preceding 11 years. The translation is noted for a rearranging of the books of the Bible into what the author believed was the correct chronological order. In the Old Testament, this order follows that of the Hebrew Bible. The name of God was translated throughout the Old Testament as "The Ever-Living". The Bible is described as "translated into English direct from the original Hebrew, Chaldee, and Greek languages." For his translation of the Book of Job which appeared in 1898, Fenton was assisted by Henrik Borgström. This was "rendered into the same metre as the original Hebrew, word by word and line by line". His translation of the New Testament is based on the Greek text of Westcott and Hort. The ordering novelty in the New Testament is that it places the Gospel of John and the First Epistle of John at the beginning before the Gospel of Matthew, thus placing the Acts of the Apostles immediately after the Gospel of Luke. Seriously that guy needs to stop reading!